If you live in the District but find yourself dreaming of strolling the Champs-Élysées, you’re in luck. The Georgetown French Market is bringing the culture, art and food of Paris to the brick-paved streets of D.C. 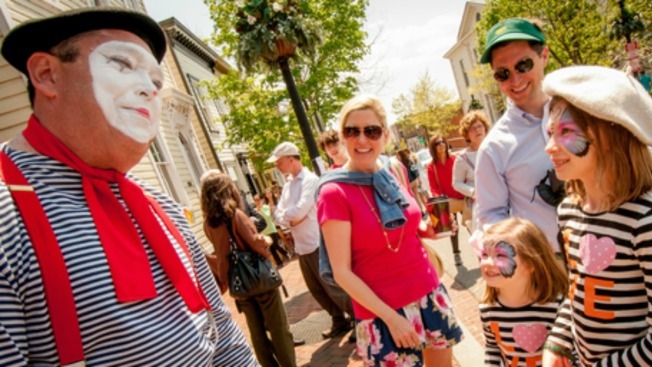 The 12th annual Georgetown French Market takes place this Friday and Saturday between 10 a.m. and 5 p.m. This small taste of Europe will take over Wisconsin Avenue between P Street and Reservoir Road in Georgetown’s Book Hill neighborhood. Have your berets handy -- the area will transform into a large outdoor market with more than 40 boutiques, evoking the atmosphere of France. Shoppers and art enthusiasts, look no further for amazing deals. The Market will offer up to 75 percent off at a variety of Book Hill shops and boutiques. Fine art, antiques, art books, furniture, jewelry, textiles, dresses, bow ties and more will be on sale with heavy discounts. View the complete list of deals here (PDF). Want to take a break from shopping to indulge in a fresh crepe and glass of wine? No problem. Neighborhood restaurants will offer deals and French food specials. Some will set up curbside on the streets of the Market to grill French sausages, crepes, sandwiches and pastries. And, of course, there will be French wine. For the kids, the parking lot at Wisconsin Avenue and Q Street will feature mimes, caricature artists, facepainters and more family-friendly entertainment. Just like the streets of Paris, Georgetown traffic is no fun. Visitors can avoid the hassle by taking the Circulator from downtown D.C. or from the Rosslyn or Dupont Circle Metro stations. Circulator rides are free on Saturday from the K Street and Wisconsin Avenue stops to Book Hill. For those feeling courageux, free parking will be available Saturday at Hardy Middle School across from the Georgetown Safeway (1855 Wisconsin Avenue, NW). More transportation info here.